Free Chart - Are We Reimbursing Employees’ Health Insurance Correctly? Zane Benefits, the leader in individual health insurance reimbursement for small businesses, announced today the publication of a new quick reference chart, "Are We Reimbursing Employees’ Health Insurance Correctly?" The easy to use chart helps small businesses understand how to correctly reimburse employees' individual health insurance. According to Zane Benefits, health benefits are an important tool for attracting and keeping the best employees, but there’s a problem. For most small businesses, traditional group health insurance is out of reach. For example, over 2.7 million U.S. small businesses do not offer traditional group health insurance today. The primary reason is cost. However, this doesn’t mean small businesses have given up on health benefits altogether. Instead, they have adopted a new health benefits strategy - reimbursing employees’ for their individual health insurance. With new rules and regulations, however, small businesses need to go about it the right way. 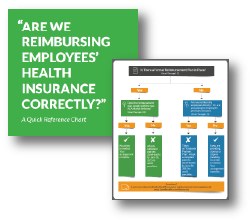 The new reference chart walks through different reimbursement scenarios and helps small businesses answer the question, "Are we reimbursing employees’ individual health insurance correctly?" Download the Reference Chart Now!